Occupational Therapy (OT) puts the “fun” back into functional by providing skilled treatment to help infants, children or adolescents to perform functionally and to achieve/restore mobility at the highest level possible. Occupational therapy practitioners work with children and young adults, from infancy through college, and their families to facilitate participation and independence. 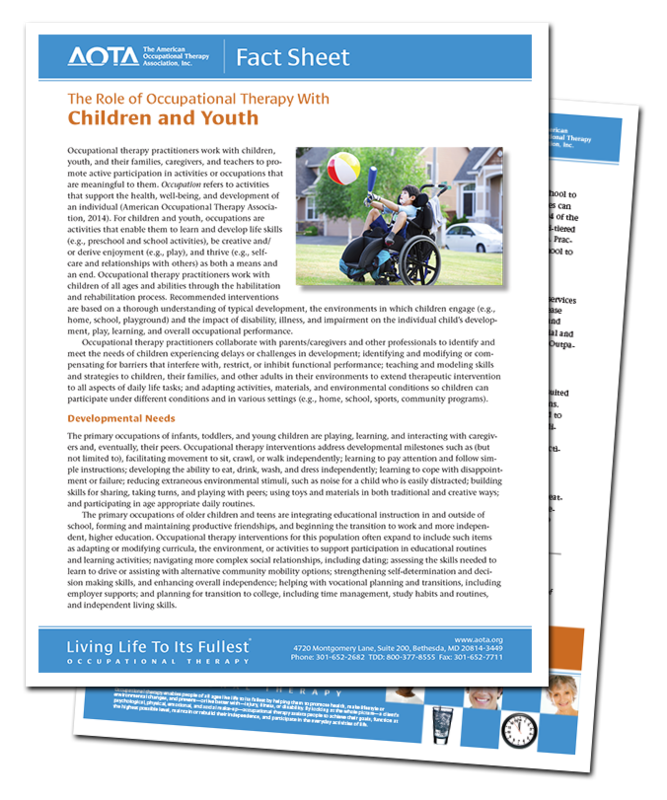 The American Occupational Therapists Association provides a fact sheet to provide information on occupational therapy’s role with a variety of conditions affecting children and families. Click the fact sheet below to see more! Elite Therapy Center was voted for Favorite Pediatric Physical Therapy provider in Waco! LOCALS LOVE US We love serving local in Waco and at our additional locations in Gatesville, West, Temple, and Killeen. You can find great resources in our PARENT PORTAL. Also, if you're looking for frequently asked questions or financial assistance available via grants, click below! • Financial Assistance for therapuetic care. • Find answers to frequently asked questions about our therapy care, benefits, and insurance applied towards therapy. • Make a Payment ONLINE for speech, occupational, or physical therapy sessions using your invoice.